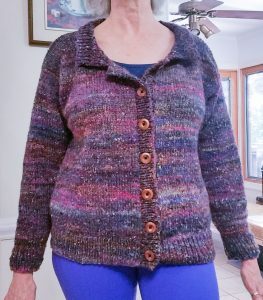 I have finished the sweater I created from the Mountain Sapphires Art Batts! I’m just taking a moment to bask in that…. It’s so beautiful. It fits. The colors are sweet. It’s warm and not scratchy. This is the fiber that I started spinning back in April when I was color-starved and ready for something fun. It took me about 2 months to knit after the yarn was spun, and another month to motivate myself to sew the seams and get the buttons on. The only thing I am not 100% happy about is the collar – it isn’t as wide as I thought it would be in terms of how it lies, but it’s OK. I am thinking about a couple of things that might help with that, but even if I leave it I am happy enough. On the spinning front, I’m nearly done with the milk fiber. I’ve got a pretty good handle on how to work with it, and as soon as I ply it (and confirm that I really know what I’m doing 🙂 I will post a spinners’ tech-tips post. SAFF is coming up at the end of the week, so I’ll be making my annual pilgrimage to Asheville, NC to enjoy that. Can’t wait! I’ll be posting all about it. This entry was posted in Art, Fiber and tagged Knitting, Spinning. Bookmark the permalink. 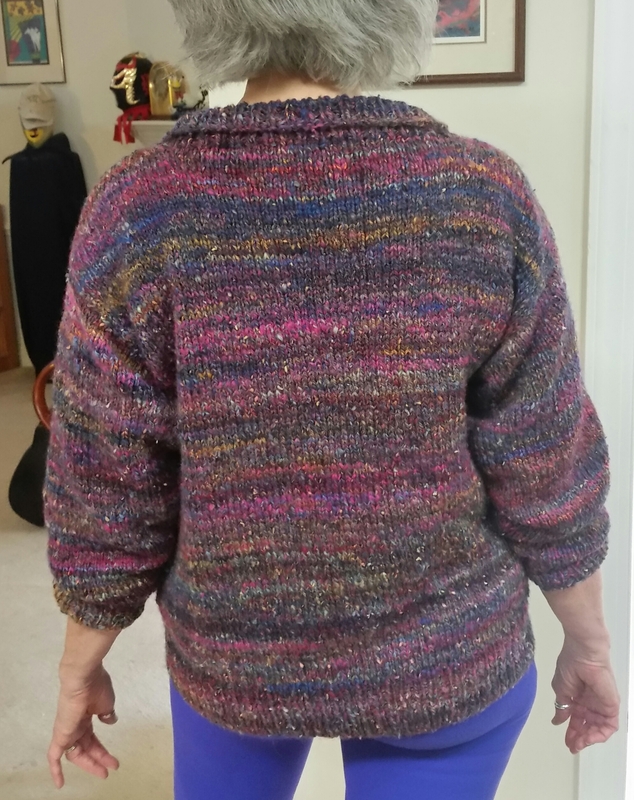 2 Responses to Mountain Sapphires Sweater Done!! Whoooaaa! Incredible & super special, I’m sure! Very beautiful! !